With Rudy in tow, plodding along at the end of his leash, I see my neighbor Mike slowly scooting himself into his truck. I wave and approach as he rolls down his window to greet me. Mike is ninety-one, and his wife died a couple of months ago. He lives next to Woody, my octogenarian friend who was widowed a few years earlier and who I visit every day or two to pilfer his candy jar before walking together in the fields. Somehow, Mike and I always end up talking about politics. We have vastly different opinions on some issues while others overlap. Perhaps because of his height, he reminds me a bit of my dad, who would’ve been eighty-eight by now. Like my dad, having been raised during the depression, Mike’s stoicism and frugality are familiar, as are the way he keeps care of his cars, his house and his yard by using plenty of good old-fashioned elbow-grease. 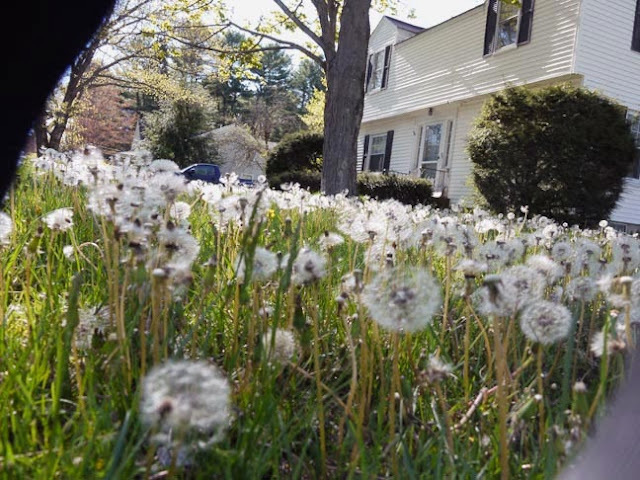 Although, when nursing his wife for months before she died, he had to let his yard go a bit, a legion of dandelions taking over in his absence. Seeing that he needed a hand with his burden, neighbors and friends pitched in to help him out. This time, Mike and I get to talking about healthcare, jobs and taxes. With his elbow propped on the open window of his car door, he says, “Everyone should pay the same amount of tax, the same percentage.” With some healthy fervor, which Mike doesn’t seem to mind, I explain the flaws in his proposal—that, for instance, 20% of a poor person’s income cuts much further into basic necessities like food and shelter than it does for a wealthy person, and in that way a flat tax isn’t equitable. Mike reminds me that he came from a poor family, that his father, a hard worker, never made more than $3,000 in his life, but that they always made ends meet. “What about the guy who comes from nothing, works hard all his life and, as a result, makes millions?” he asks. I point out how the profits wealthy people enjoy come, not only from their hard work and initiative, but from the sweat of subordinates who, despite their effort, often live paycheck to paycheck. In my mind I imagine fast-food employees, migrant workers, garment makers and even nurses. I tell him that trickle-down economics hasn’t worked and that raising the minimum wage to a living wage would help hard working people get off of government assistance without killing jobs. “Many big companies are sitting on their profits, they’re not always investing in jobs, and they’re making millions and billions by exploiting others,” I say, and Mike nods his head as if in concession. We talk about healthcare and of the junk insurance policies that have recently been dropped, the ones that shouldn't exist, the ones with lifetime caps and astronomical deductibles, the ones that exploit preexisting conditions and that don’t cover the cost of countless procedures, the ones that people pay for but get next to nothing in return—besides bankrupcy—when they become injured or ill.
We finish our conversation, Mike and I say so-long and as he drives off down the street he honks and waves. I stroll with my gimpy dog back home to my disabled, legally blind, seizure-ridden, autistic, nonverbal, developmentally delayed, drug-reliant son. I think of the cards Michael and I have been dealt, yet feel fortunate that we have affordable health insurance that can’t be taken away from us. I think of how we don't mind paying a little more in taxes so that others who aren't as fortunate as we are—people born into poverty or just simply down on their luck—can have health insurance, too. Because, besides being a human right, I understand that healthy citizens make a healthier community makes a healthier economy with fewer healthcare costs in the long run. I wonder if the complainers, those in congress, and the powerful wealthy backing them, might feel differently about sabotaging—rather than improving—the Affordable Care Act if they spent just one day in the life of someone working a minimum-wage job with no health benefits and facing a family member's diagnosis of cancer. I wonder if they'd appreciate—and take—a leg up. I'm so depressed about what's happening with the Affordable Care Act and the insurance companies once again making off like thieves -- well -- I can't even think about it.